A new favorite spring tradition for UTA baseball fans is watching the Mavericks host a marquee opponent at Globe Life Park, home of the Texas Rangers. On March 6, the Mavs will host powerhouse Baylor University in a 6:30 p.m. matchup. 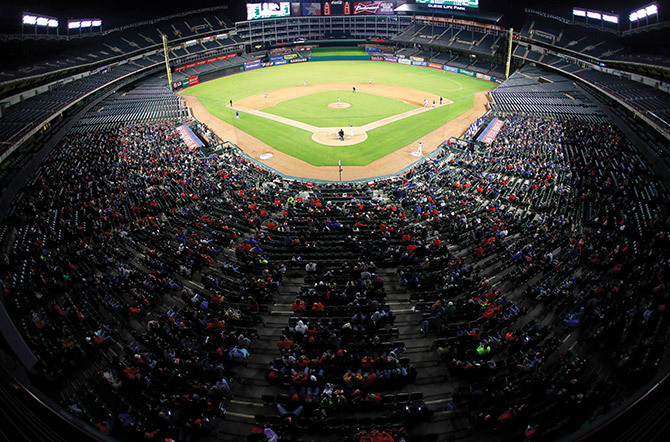 "It is always a great opportunity for our student-athletes to compete at Globe Life Park," says Coach Darin Thomas. "For years, our relationship with the Rangers and the Arlington community has been wonderful, and we are fortunate to have the chance to play at Globe Life. We have had some great crowds and have put a tremendous product on the field since 2013." This marks the sixth consecutive year that the Mavs have played at the home of the Rangers, with UTA facing off against the best foes in the region, including University of Texas, Texas Tech, Texas A&M, TCU, and Oklahoma. Last year, UTA posted a 5-1 win over fourth-ranked Texas Tech in front of 4,259 fans. It marked UTA's second win at Globe Life in the last three years, as the Mavs earned a walk-off win over Texas in 2015. "It's a great place to play," Thomas says. "You don't have to get your guys ready to play. We always bring in quality opponents, and it is always a great crowd. Any time you can do that, it's a plus for your program." For ticket information, visit utamavs.com.